Two days gone and so much to catch up on! We spent yesterday sailing, but still got a lot done! Since our group is made up of people from 5 different states, we didn’t have a day to organize all of our gifts and humanitarian relief for the orphans before we left, so we took the better part of five hours to do that yesterday. I was really amazed at how much our group was able to gather– hats and gloves for boys and girls of all ages, toy cars for small boys, Beanie Babies, tennis balls, pencils, toothbrushes and toothpaste, and the list goes on. Each bag was packed individually by one of our team members, was counted, recounted, and then tagged with the appropriate date, orphanage, and boy/girl designation. Lots of work but everyone pulled together marvelously and we were able to get done everything we needed to, and more importantly we got it done before dinner! While yesterday was a packing day, we were still on the ship and had some free time to relax, regroup, and catch up on sleep, (except for Deneen). We left the ship at 9am headed for Simferopol– a two hour bus ride across the Crimea. Our group arrived at our first orphanage to find about half the kids that we expected (things change quickly in Ukraine…) This worked out fine, though, as we got to spend more quality time with each child. The program ran similarly to what I previously described in our Odessa blog entry. I heard a fantastic story about Craig Mintz at the rehabilitation center, our 2nd stop of the day. There were about fifteen children we visited at the facility, with handicaps ranging from amputations to cerebral palsy. 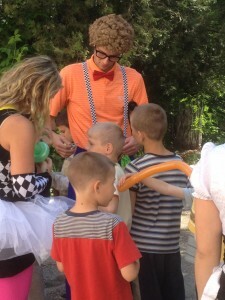 While our group was able to hold and play with each child, there was one small girl in a purple shirt, suffering from cerebral palsy who did not want to be picked up at all… until she saw Craig, that is. She asked her nurse in Russian if he would pick her up and he gladly obliged. She immediately gave him a kiss on the cheek and rested her head against his shoulder. Craig comforted her and told her that he loved her. He held her for quite some time, as she refused to be put back down in her chair. Finally, it was time for the group to leave, and Craig put her down gently, telling her all the while that he loved her. It was later noted by another team member that Craig was the only person in our group who wore a purple shirt today. Was it her favorite color? At Orphanage #3 we saw a bigger group of children, ages 5-16. Our clowns faithfully led the groups of orphans from station to station. The ladies painting nails focused on the opportunity they had to hold each child’s hand. Those painting faces took their opportunity to touch each child’s face. This was the first time on this trip, however, that we really had a hard time connecting with the older kids (particularly boys). During the music and Sveta’s story, they weren’t simply not paying attention, they were actually playing football (soccer) behind the smaller children. We tried several times to get them gathered back in with the larger group, but within a minute or so they were back at it, distracting and being distracted. They were glad to accept the new soccer ball we gave them, but seemed too cool for the rest of the program. We’re making some adjustments to our program to try to engage the older teens better, so this is an area where we can really, really, really use prayer. These kids are a couple years, maybe a couple months in some cases, from being put out on the street with nothing– no education, no skills, no connections, no jobs, etc. The boys will end up doing or selling drugs, as alcoholics, in prison, or worse. The girls will end up as prostitutes or slaves in a foreign country. Outside of God’s grace and God’s people, those are their only options. This may be our last chance to reach them with the message that they are loved, they are valuable, and they are wanted. Why did Craig pick a purple shirt to bring on this trip, and why, of all days, did he wear it today? It seems that we’re here for a reason. These are desperate times for these children and we’re on a desperate mission. Please continue to pray. You are all loved and missed.